A devoted sister greatly waits for Rakhi festival to take pleasure in a charming way. So to achieve your surprises you can order a striking combo of 2 Rakhi with 24 Pc. Ferrero Rocher and Kaju Katli. Your brother will surely be astonished by the delicious taste of Kaju katli. The sweetness of chocolate adds a tempting effect on the relations between brothers and sisters. Their bonding becomes stronger and efficient when the sweet chocolate melts into their mouth. 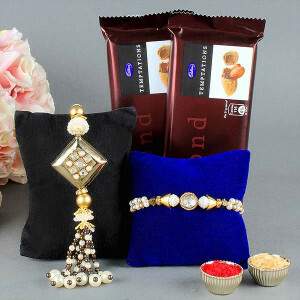 Buy this exclusive combo that contains 2 Temptation and Rakhi For Bhaiya n Bhabhi. - 1 Set Of Rakhi For Bhaiya n Bhabi. Celebrate the bond of love and care you share with your adored brother by gifting this magnificent combo. This combo consists of 1 Rakhi, 100gm Cashew, and 100gm Almond along with Roli Chawal. Astonish your dearly loved brothers with these designer rakhis accentuated with appealing beads and studs. Take care of his fitness by coupling these 2 beautiful rakhis with 400gm Dry Fruits. When it comes to delivering love and happiness, roses are the best option. Thus, send this Gorgeous Arrangement of 5 White, 10 Yellow, 15 Pink Roses in Pink Paper Packing along with Rakhi Roli and Chawal. - 5 White, 10 Yellow Roses, and 15 Pink Roses in Pink Paper Packing. Send this stunning bunch of 12 Mix Gerberas Bouquet and Rakhi with Roli Chawal to express love to your dearest brother. The Gerberas are specially selected from the fresh group; they will make the day amazing and special. Roses and rakhi together make the perfect gift for Raksha Bandhan. Thus buy this beautiful 12 Mix Roses Bouquet with Rakhi and make this special day more memorable for your loving brother. Roses are the tradition of happiness. Red and white roses are the perfect combination for any special occasion. Thus, send this beautiful bunch of 12 Red and White Roses with rakhi, roli and chawal to show love and care for your dear brother. Roses are the symbol of love and care. 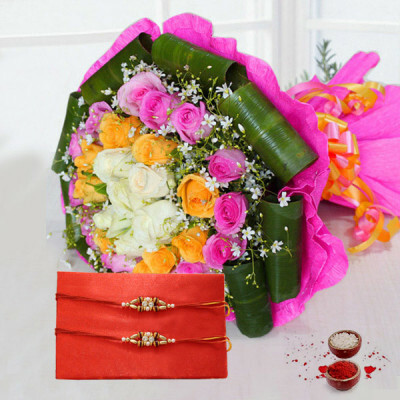 Send this Stunning Handpicked Bouquet of 12 Red Roses packed in a beautiful paper with rakhi roli and Chawal, it just sets the whole thing right. Yellow roses are the symbol of friendship and a brother is every sister's true childhood friend. Rejoice this enduring friendship with this Raksha Bandhan Gift Hamper that contains 12 Yellow Roses Bunch with Rakhi, roli and chawal. Make your brother feel beautiful and pleased with the bunch of these beautiful white flowers. Gift your loving brother this bouquet of 10 White Roses in Blue Paper Packing and Rakhi Hamper. Raksha Bandhan is a vital Indian occasion celebrating the epitome of the unique attachment shared between a brother and a sister. 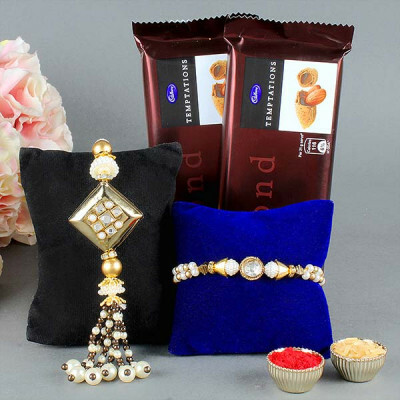 Gift this charming rakhi combo to your beloved brother along with 1 Kg Gulab Jamun. Your brother is the only one that would fight the world for you. Let him know how much you love and care him with this combo. It consists of 1 dazzling rakhi along with 500 gm Soan Papdi to enhance the bond even more! Offering sweets to your loving brother has been an age-old tradition. On this auspicious festival of Raksha Bandhan, surprise your loving brother with this beautiful Rakhi, 1kg Gulab Jamun, and 1kg Rasgulla. This celebration hamper is ideal to gift to your loving brother on the delightful occasion of Raksha Bandhan. It consists of 1 kg Rasgulla nicely packed for your brother along with 2 stunning rakhi accentuated with pearls. This is an auspicious Rakhi that has high variety pearls and more woven in one thread. This Rakhi is perfect for this Raksha Bandhan. 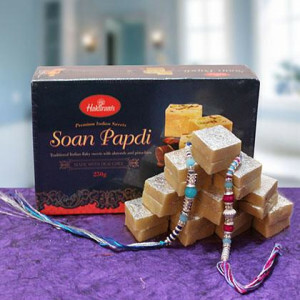 Make it a Raksha Bandhan Combo by adding 500gm Box of Soan Papdi and greeting card to it! 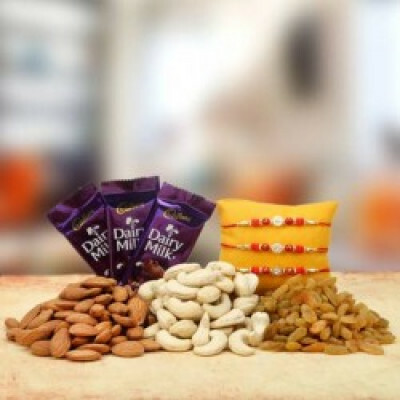 Make this Raksha Bandhan memorable for your dearest Brothers with this sweet Gift Hamper. It has 2 Rakhis with 500gm Soan Papdi and 500gm Kaju Katli. Perfect gift hampers for this auspicious occasion. Soan Papdi is appreciated by everyone because of its flavor and also for its shelf like. Order this delicious Gift Combo for your loving brothers that have 2 Rakhis with 500gm Soan Papdi. Celebrate the cuteness of your relation with your darling brothers by giving them this cheerful surprise of attractive rachis. This Rakhi special consists of 2 Rakhi with 5pc Ferrero Rocher. Raksha Bandhan is not just about sending a Rakhi to your dearest brother. It is also about lacing the occasion with your affection and love in unique ways. Thus, send this unique rakhi combo that consists of 3 Bournville and Rakhi with Roli Chawal. Rakhi secures the bond between a sister and brother. Thus, to make this bond stronger a beautiful combo of 2 Rakhi, carnation and lily bouquet with Fererro rocher is perfect. This beautiful rakhi will absolutely add a radiant glaze in your relations. Rakhi grabs a special place in everyone’s heart that will enhance closeness between brothers and sisters. Thus, adopt this attractive combo that will express your emotions in a different way. This combo includes one Rakhi for your brother, a beautiful arrangement of roses, 2kg fresh fruits, and role chawal. Raksha Bandhan is a perfect time to express your emotions that how much you love your brother. So, this rakhi fest, delight the heart of your brother by gifting him this unsurpassed rakhi combo that consists of 2kg fresh fruit, rakhi and rolichawal. 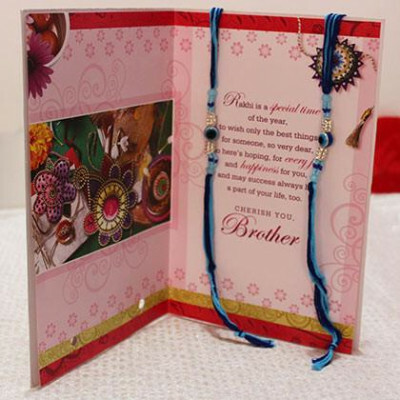 Raksha Bandhan is a perfect time to express your love towards your brother. Wish him lots of success and prosperity by sending this beautiful combo and makes him feel special. The combo consists of 10 mix roses and Ferrero Rocher with rakhi. Rakhi is a sacred festival that makes the sibling relationship more strong and lovable. This Raksha Bandhan, send your wishes with this attractive combo that contains 12 red roses bunch, mix dry fruits and rakhi. There are various attractive products or gift hampers that are needed to celebrate the occasion of Raksha Bandhan. 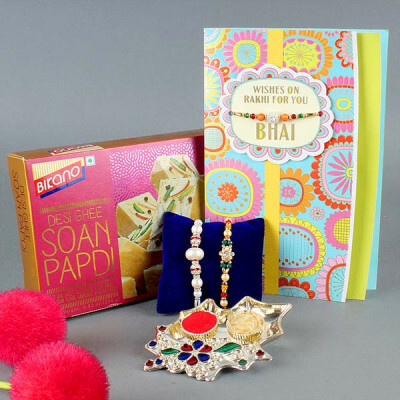 This is the perfect and top-notch gift hamper for this Raksha Bandhan that consists of 2 Rakhi with 1 Greeting Card along with roli. Don’t allow the distance spoil your festival. All you require on this Raksha Bandhan is an unsurpassed combo to articulate love and admiration to your brother living away from you that consists of 2 Rakhi with Roli Chawal and 1 Greeting Card. Raksha Bandhan is a blessed festival that makes the brother-sister relationship more strong. This Raksha Bandhan, send your wishes with this amazing combo that consists of 1 Rakhi with 1 Greeting Card. Rakhi is not just a simple thread, but it is a thread of love that will make the love of a sister for his brother even stronger. 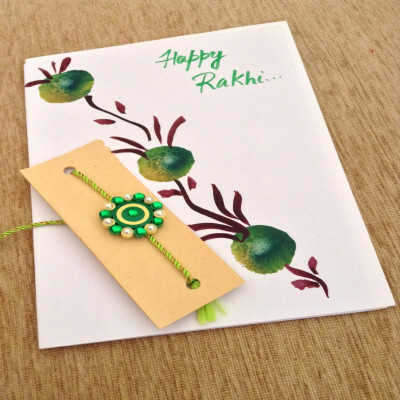 Thus, make your occasion memorable from this amazing combo of 2 Rakhi with 1 Greeting Card. Your darling black forest flavor is now available in the Rakhi gift hamper. Send it to your adoring brother along with Rakhi to make the day as sugary as the taste of the cake. Perfectly decorated this 1 Kg Butterscotch Cake is the ideal choice to rejoice this year's Raksha Bandhan. Astonish your beloved brother with this astonishing Gift Hamper that not only contains a cake but a beautiful Rakhi along with Roli Chawal. This Raksha Bandhan forward Rakhi along with Roli Chawal and best wishes greeting card along with 1 Kg Chocolate Cake is as appetizing as it looks. It is super luscious with a flavor to pamper in. This 1 Kg Square Shape Pineapple Cake is made using high-quality ingredients. The sugariness of this cake cannot be compared to any other pineapple cake. It has the capability to make your Raksha Bandhan sweeter. Double packets of Cadbury Celebration chocolate along with two rakhis are here to make your Raksha Bandhan more pleasure. Send these gifts to your loving brothers and make them pleased on this divine occasion. Your Gift Contains 2 Cadbury Celebration and 2 Rakhi. On this divine occasion of Raksha Bandhan, give your surprise to your loving brother in a modern twist. Instead of the usual mithai, convey Dairymilk Silk chocolates to your dazzling Brother. Order this combo that contains 2 Rakhi with Roli Chawal and 5 Dairymilk Silk. It is supposed that the thread of Rakhi has a strong authority to hold the loving relation of siblings. Thus, add the more power of love in this occasion by sending this combo that contains 2 Rakhi with Roli Chawal and 16pc Ferrero Rocher to your brother. Rejoice the lovability of your relation with your darling brothers by giving them this joyful surprise of designer rakhis. This combo consists of 4 designer rachis and Half Kg Soan Papdi for your brothers.